Back in October of 2011, I took a trip through the south that landed me in Clarksdale, Mississippi and Memphis, Tennessee. Before then I had the cursory blues knowledge that any music fan might, but the stops in those two towns made me fall deeply in love with the music. (I made a short mix of some of my first blues infatuations back in January in 2012 in case you’re interested.) Since then, I’ve grown my collection, and I’ve become particularly interested in the blues as dance music. In its heyday, the blues were played in many ways and served many purposes, but my favorite recordings are the ones that put me in a trance, where the guitars drone and the vocals punctuate. Even when there’s no percussive elements in a recording, you can almost hear how dancers would’ve clapped along or stomped their feet to fill in the space. 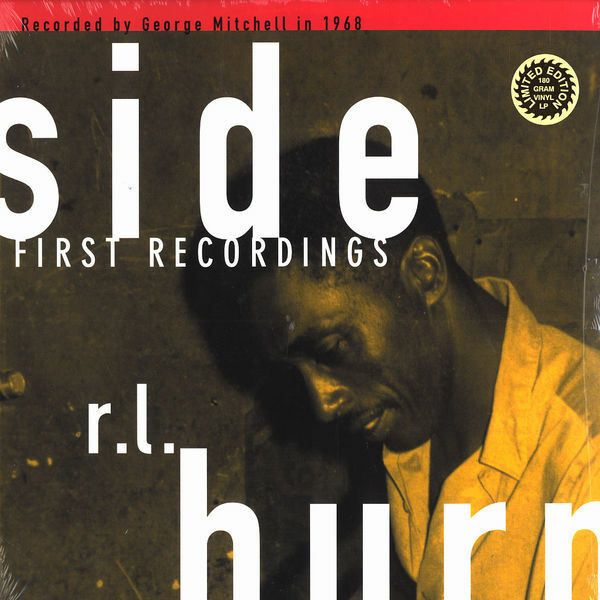 The first recordings of RL Burnside contain some of the hardest dance tunes I’ve heard in the blues. Absolutely crushing stuff. (I played “Skinny Blues” at peak time at one of the most recent Mister Sundays.) Even the songs that aren’t dancers are full of groove and swagger. I can’t help but nod my head through the whole record. The story of how this album was recorded is also very cool. George Mitchell, one of the great blues scholars and field recorders, was in Mississippi in 1968, searching for unknown players. He was led to RL by Othar Turner, a legendary blues man himself. When Mitchell arrived at Burnside’s small home, his wife, nine of his ten kids, and a few local friends were squeezed inside. Mitchell took a seat on their couch, and RL started up. After the first song, George Mitchell, mesmerized, hit record on his tape machine and captured the album we’ll listen to Sunday. If you’re interested in any more of the story, feel free to come to the booth and ask to see the jacket. (I also have the first issue of some of the recordings, which has a little more back story. I’ll bring that, too.) I’m really looking forward to playing it for you – and, selfishly, taking yet another opportunity to listen to it myself!